Apathy in the face of continual violence is something someone who has never lived through a war cannot understand, Nega Mezlekia, the 42-year-old Ethiopian-Canadian writer and structural engineer, writes. In Notes from the Hyenas Belly (2000), his award-winning memoir of life in war-torn Ethiopia, Mezlekia recalls, People had long since ceased to huddle under their limbs at the sound [of bombs]. Numbing themselves to the terror was their only, if weak, line of defense. Attribute it to an armor of apathy, incredible courage, or sheer good fortune, but the fact that Mezlekia survived poverty, famine, insurgency, and revolution is nothing short of remarkable. What is perhaps even more impressive is his work ethic, which is evidenced by four university degrees, a straight-A academic record, a Governor Generals Award for Nonfiction for his first book, and a novel. Mezlekia came of age under the brutal reign of Lt. Col. Mengistu Haile Mariam, the socialist military dictator who supplanted Emperor Haile Selassie. During that bloody era, known as the Red Terror, neighbors with grudges against other families could denounce them to the kebelecommunity councils set up by Mengistuwhose brand of justice was almost always death. Mezlekia lost his parents and many of his friends in the revolutionary opposition to the junta. In the early 1980s, Mezlekia got his precious ticket out of the nightmare: an opportunity to study abroad in Europe. 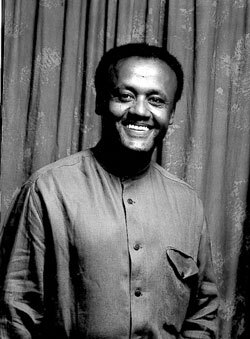 But two years later, looking to come home, Mezlekia found that Mengistu was still in power; the junta had received backing from the Soviets and Cubans. Mezlekia had little choice then but to flee to Canada, where he was granted refugee status. The process of writing his memoir, which took him four years to finish, was understandably difficult. After its publication, Mezlekia was dealt another blow when his editor, Anne Stone, claimed she had written all but the last 20 pages. Mezlekia reacted by suing Stone, as well as her publisher, for defamation. The case is still pending. Mezlekias second book, The God Who Begat a Jackal (2001), however, proves that the writer is not a fraud. Even a skeptic must admit that the author of this book is talented, Janice Paskey wrote in the Calgary Herald. Mezlekia hopes eventually to pursue writing full-time. When I read García Márquez, I think, I have better stories to tell. Its a huge claim, I know, but Im going to prove myself, he said to Torontos Globe and Mail. In more ways than one, of course, he already has.